For my birthday in 2008, my sweet husband bought me a camera. Somehow I had lived well into adulthood and never had a camera of my very own. I had been wanting one for a while and I knew I wanted a small, user-friendly-idiot-proof digital one to carry with me everywhere. He knocked it out of the park and bought the perfect little camera for me. Immediately I began to look at my whole world through my camera’s lens. I started talking to friends and coworkers about their own interests in photography as a hobby, looking at their pictures and taking tons of my own, experimenting and learning what my camera would do. What a joy to see everything in a new, more mindful way. The grounds around my workplace are beautifully landscaped, so I spent a lot of lunch hours outside photographing flowers, trees and insects. I have always been fascinated by bumblebees, and I spent most of that spring and summer stalking them, trying to take the perfect bee picture. In all this stalking, I never once got stung by any kind of stinging thing, by the way. I received plenty of mosquito bites, but not the first bee sting. 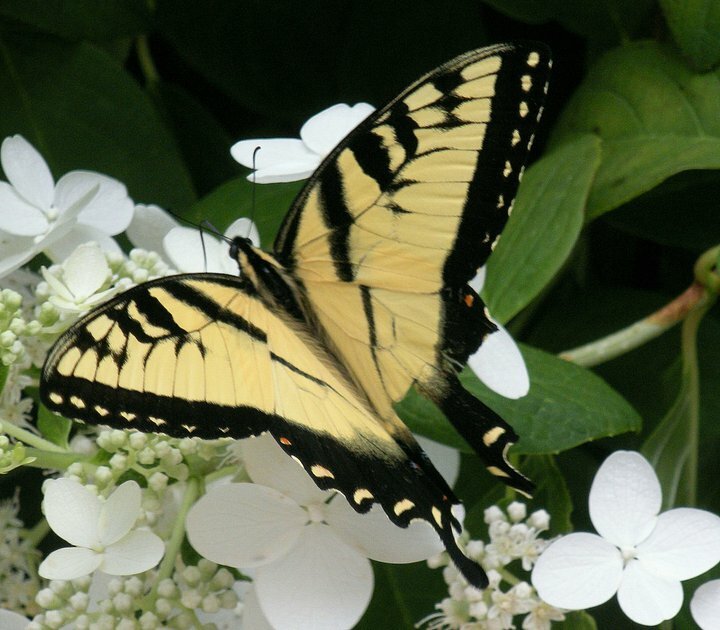 One afternoon I was so focused on stalking the bumblebees that I almost missed a gorgeous yellow swallowtail butterfly that landed right in front of me! Once I saw it, I prayed a quick prayer: “Lord, just let it stay there long enough for me to shoot it…with my camera!” I was able to get several shots before if flitted and floated away. It got me thinking about how often I go about my life with tunnel vision, so focused on one thing, one outcome, one purpose. How often I miss something wonderful while chasing after something else. I could have easily missed—or dismissed—the butterfly while stalking the bumblebee, and missed a wonderful moment of beauty and surprise. I am grateful for the butterfly’s lesson. In the fluttering of its wings I could almost hear God saying, “Be open to the unexpected. Be open to surprise. Be open to blessing!” Indeed. Lord, help me to be more open to Your wonderful surprises!